Looking to set good intentions for 2019 and build healthy habits? 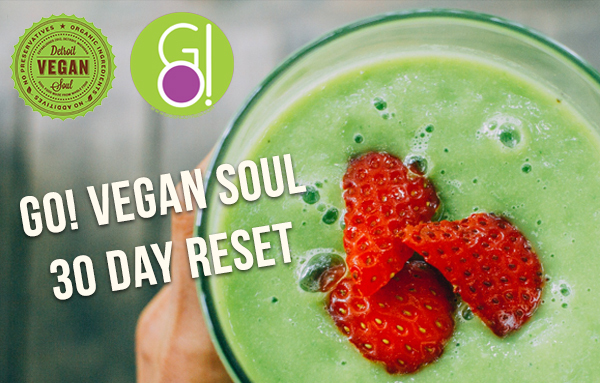 Explore the benefits of a plant-based diet and join Detroit Vegan Soul and Go! Smoothies for our Fourth Annual 30 Day Vegan Challenge and become part of a team of people dedicated to making their lives healthier. Make the pledge to commit to a better you. Enter your email address below to receive our daily emails for tips and tricks to help you stay on track. We respect your privacy and will not sell, rent or give your information to anyone. By completing this form and clicking save, you are giving expressed consent to receive marketing emails from Detroit Vegan Soul.